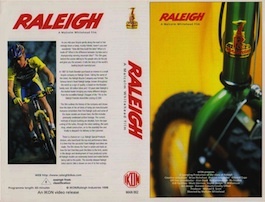 Notes: Unreleased documentary feature directed by MALCOLM WHITEHEAD about the Raleigh bicycle manufacturing company. Part of the "Real Life" series on the IKON documentary offshoot MAN along with MAN 001 Manchester Airport and MAN 003 Shop. In 1887 Sir Frank Bowden purchased an interest in a small bicycle company on Raleigh Street, Nottingham. Taking the name of the street, the world famous Raleigh Bicycle Company was formed. 60 million bikes and 110 years later, Raleigh is the market leader bringing you many different designs from the incredible Chopper of the 1970's to the current championship winning M-Trax 450. This film outlines the history of the company and shows how the bikes of today are manufactured. Everyone remembers their first Raleigh cycle and some of the classic models are featured here, the film includes some previously unreleased archive footage. Current methods of bicycle production are show, from the laser cutting of the tubing, through the robot welding, the paint shop, wheel building, on to the assembly lines and finally to despatch for delivery to the customer. There is a feature on r.s.p. Raleigh Special Products, who hand build the top end performance bikes. It is here that the highly successful Team Raleigh mountain bikes are made. The film shows the Team in action and looks at how the fact that they push the bikes to the limit assists in the design and development of future mass produced models. The recently released Raleigh Select electric bikes is shown on one of its first outings.